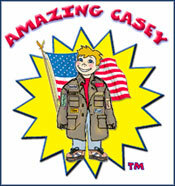 "Casey and the Amazing Good Finder"
Teaching Adults and Children How To Succeed In School, Life and Relationships. 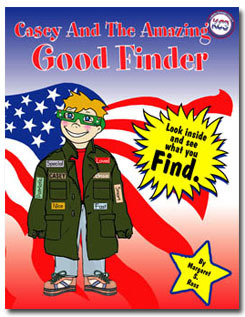 Casey and the Amazing Good Finder is a heart-warming fable about Good Finder secrets. Mr. Max, the bus driver, and Mrs. Hassell join the colorful cast of Casey characters. As the story opens, Casey wonders about Mrs. Bobbin, one of the school’s happiest and nicest people. Casey ponders these questions: Was Mrs. Bobbin born this way? Was it something she learned along the way? Was she ever grumpy? Was she ever rude? Did she ever have a bad attitude? At the end of this delightful story, you will FIND the answers. This story is a key part of the Good Finder Edition of the Kamaron® KC3™ Positive Label Certification Program. Official partner in education of the National Museum of Patriotism. 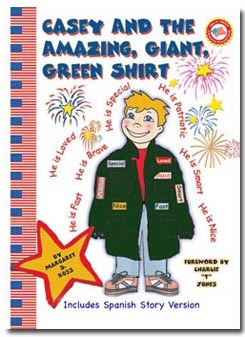 "Casey and the Amazing, Giant, Green Shirt"
The Greatly Loved, Special, Brave, Smart, Nice, Fast, Patriotic American Kid! Casey And The Amazing Giant Green Shirt is a heart warming fable about the power of words to change the world; showing adults and children how to succeed in school, life and relationships. "Casey and the See Through Head"
"Casey and the Growing Spurt"
Enjoy Casey's next big adventure where he learns the real meaning of friendship and family. Book proceeds are going to support the educational work of the Kamaron Foundation and our "Giving Thanks To Military Families" outreach - "Operation Pint-Sized Patriots". Where E-books are being provided at no charge. Casey was helping mom gather clothes to give to the Red Cross when they discover his grandfather's old, giant green Army shirt with Casey's name already on it. The shirt's missing badge becomes the catalyst for the week's adventure. During the week, Casey experiences the joy of positive/kind words like "Special" or "Nice" and he experiences the real pain of unkind words. You'll enjoy being part of Casey's journey and be touched by the story's surprise ending. * Addresses the awesome power of words -- of labels. Book includes Parent and Teacher discussion and activity pages. This Casey story is the foundation for the elementary level Kamaron KC3 Positive Label School and home certification programs. The last thing Casey expected to wake up with this morning is a case of See Through Head. Things and thoughts that had always stayed on the inside of his head were magically appearing on the outside of his head! Uh-Oh. It might be contagious! Racing the clock, Casey uncovers all Ten Top Secrets. Like a super hero, he can suddenly see through disguises, hearts, and time. How will Casey use his new powers? Join Casey on the most amazing day of his life. • Includes "Family and Teacher Discussion Guide"
Story is a key part of the Kamaron KC3 Positive Label Certification Programs. Official Partner in Education and Character Education Resource of the National Museum of Patriotism. Psst. Watch out for the whisper wars! Casey is pretty satisfied with his looks and his life. Middle School is good. People like him. He has things under control. But that is all about to change. Casey's world is suddenly turned upside down. His popularity is on the line; Casey faces some really tough choices. He experiences the pain of unkind words and of being "left out". Casey's long awaited "Growing Spurt" arrives in disguise as learns what friendship, family, character, kindness, honesty, bravery, and patriotism are really all about. Includes Parent and Teacher discussion and activity pages. This Casey story is foundation for the middle school level Kamaron KC3 Positive Label School and home certification programs. Margaret Ross is the president of the Kamaron Institute and the Kamaron Foundation. 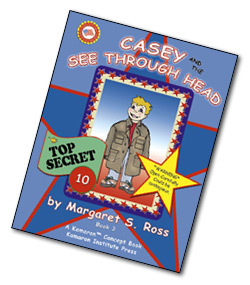 Margaret wrote the first Casey story as a gift to military families. She created the National Positive Label Certification Programs (for school, bus, home, and after school) and wrote these new Casey stories at the request of educators, parents, and helping professionals. She is an award-winning speaker, journalist, author and consultant. Margaret and her husband, Bill, live near Atlanta, Georgia. "We have found a lot to like in the KC3 Program. Program addresses the broad range of character traits mandated for Georgia schools and offers special attention to bullying. "The materials that accompany the story are easy to use and laid out in a process that can be adapted to a range of school settings and resources, and offer a wonderful flexibility for educators in creatively implementing the program. "You are holding in your hands a living classic. Never have I read a children's book so packed with entertainment, education and motivation. Every page has a lesson on patriotism and character building. I enjoyed it when I read it and even more when I reread it. In all my years of teaching people to love to read and the importance of books, I've never read anything quite like it. It is truly tremendous and young and old are going to love it." - Charles E. Jones, CPAE and author of "Life is Tremendous"
"Mrs. Bush thanks you for your work and hopes you will continue your efforts to promote reading."